Welcome to the beautiful Fornetto wood fired garden oven and smoker, in which you can create authentic pizzas, bread, roasted meats and a wonderful selection of baked dishes. Cast iron doors and solid steel construction give a traditional look coupled with modern ingenuity to ensure confident and safe cooking. 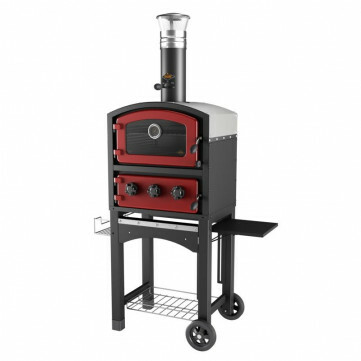 Each oven is designed to use any approved combustible fuel including wood, charcoal, briquettes and fire lighters. 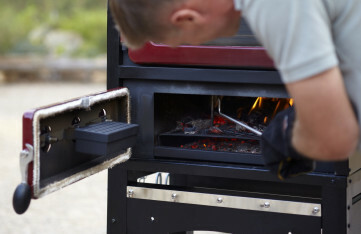 Paper and cardboard can be used to help get your fire started, However if customers intend to use natural wood to smoke their dishes, then it is best to use natural hard wood logs and not soft woods such as pine, because the resins in soft woods are likely to taint the food and leave a bitter taste. Packaging materials such as polystyrene, plastics or wood that has been chemically treated should NOT be used in this appliance under any circumstances. Each oven features fully insulated walls, providing a safe and convenient cooking environment. 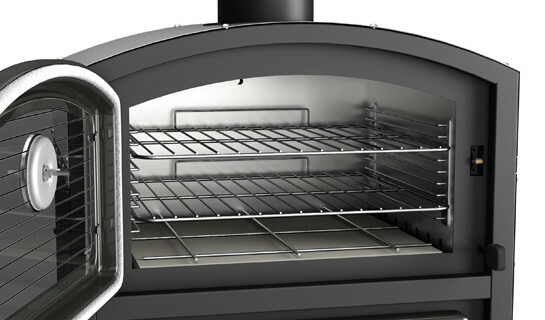 The ventilation dials on the front of the combustion chamber work in conjunction with the flue damper by allowing air to be drawn into the combustion chamber and through the oven, thereby controlling the flame and raising or lowering the oven temperature. 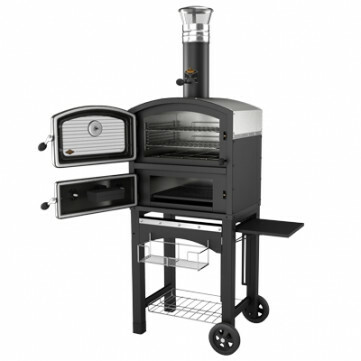 The insulated oven is also ideal for providing warmth as an outdoor heater on those cooler evenings. 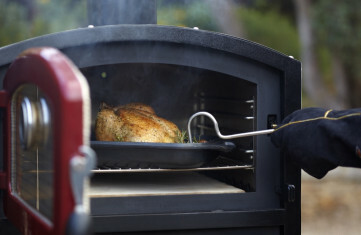 With its unique Smoker Slide, you can turn your oven quickly and easily into a smoker oven. Set the ventilation control on the chimney flue to Smoke - this closes the damper inside the flue and allows smoke to remain within the wall cavity. 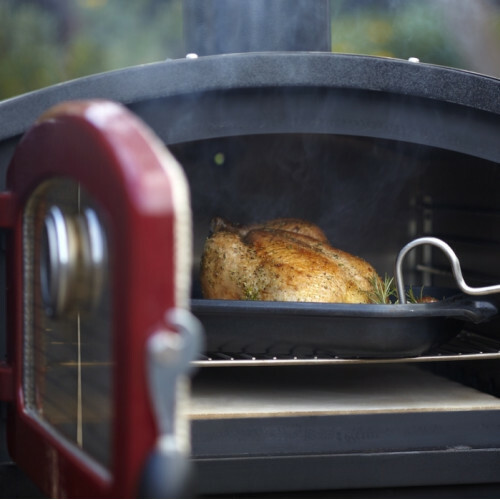 By pulling out to open or pushing in to close the Smoker Slider, you control how much smoke enters the oven chamber and flavours your food. 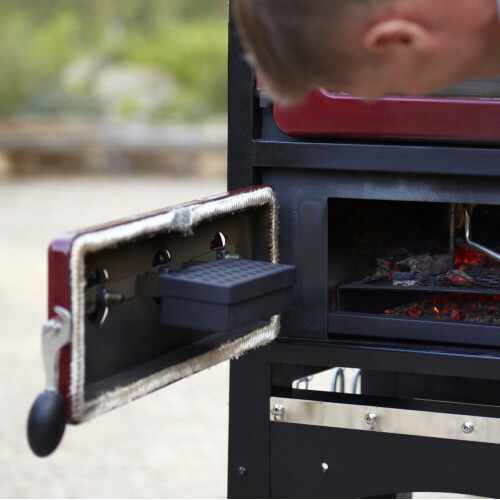 For even greater impact, place a small amount of flavoured woodchips such as Mesquite, Hickory, Apple or Oak into the detachable smoker box. You can transform even the simplest dishes into something unforgettable.